Last weekend several members of team Beeriety went down to Delaware to investigate the Dogfish Head Brewery. Dogfish Head is one of the most popular craft breweries in America, having built a reputation for unconventional and experimental beers of all sorts and sizes. They are probably best known for intensely hoppy beers such as the 60 Minute, 90 Minute and 120 Minute IPAs, but they also specialize in modern recreations of historical beers, such as the Midas Touch, a beer based on the residue of an alcoholic beverage found in the tomb of King Midas in Turkey dating back to 8th century BCE. None of us knew quite what to expect when we made the long trek from Boston to Delaware, but we were all pleased by what we found at the brewery in Milton. 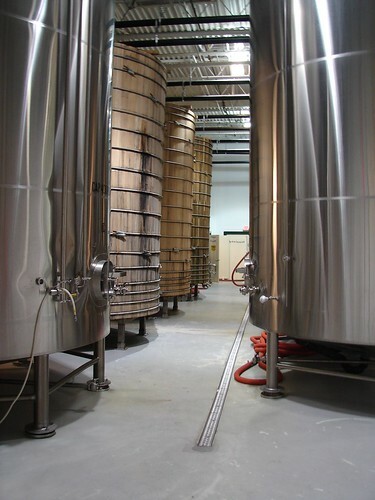 You’re allowed to get quite an intimate look at the brewing facilities and learn quite a bit of the company’s history. Besides brash innovation and experimentation one of the qualities which Dogfish Head is known for is it’s rapid growth and expansion. Even amidst the current economic downturn around the country, the brewery has steadily grown in size, at the staggering rate of 40% per year in the last few years. When we pulled up to the brewery the first thing we noticed was the evidence of construction. Clearly Dogfish Head’s “Off-centered ales for off-centered people” has come a long way from its early days. 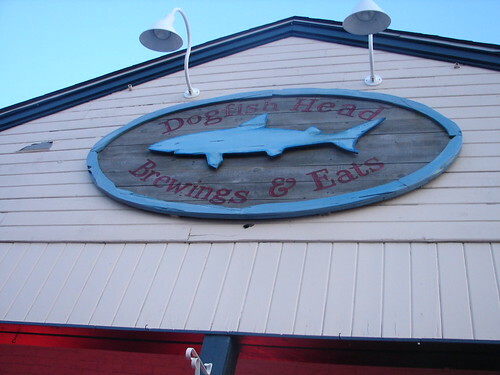 The tour begins with a look at Dogfish Head’s humble beginnings. When Sam Calagione opened the brewery in 1995 it was the smallest commercial brewery in America. On display is the very first brewing setup he used to make beer, which looks almost antiquated in it’s simplicity and small size. In the beginning it took Calagione and a co-worker 10 hours to bottle just 100 cases of beer, today they are the country’s 21st largest brewery, producing almost 2.5 million gallons of beer a year. 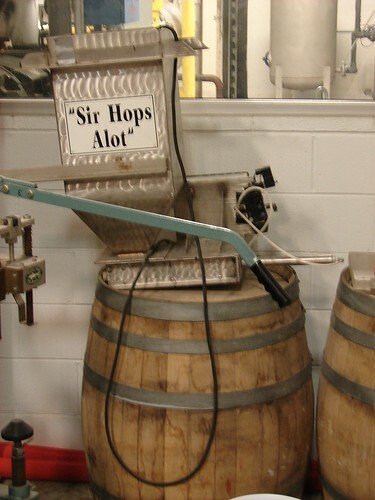 Also on view is “Sir Hops A Lot” a device designed by Calagione to allow for continuous hopping of beer during the brewing process, which makes his famous 60 Minute IPA and other continuously hopped beers possible. In addition to the innovation Calagione has brought to new beers which defy categorization, he’s also innovated new brewing processes. Besides “Sir Hops A Lot” Calagione has also built “Randall the Enamel Animal,” which is described as a organoleptic hop transducer module (whatever that means). Basically beer leaving a keg passes through Randall, a cylinder full of hops and a filter, re-hopping the beer once more before it reaches your glass. The tour continues with a look at the many barrels and bright tanks which produce the beer which has become so loved by so many beer drinkers, including a wooden barrel made from palo santo (holy wood in Spanish), a rare type of wood from Paraguay which is so dense it sinks in water, making it the perfect vessel to contain fermenting beer. The barrel is fifteen feet high and ten feet in diameter, and holds nine thousand gallons. After getting to explore most of the brewing facilities we were provided with four beer samples, Shelter Pale Ale, Midas Touch, Raison d’etre and Indian Brown Ale. Three samples is the maximum the state allows. Our tour guide implored us to contact Delaware state representatives to plead for a more samples, but in the meantime we were happy to try the beer we were provided with. After the brewery tour we headed 20 minutes south to Reboboth Beach, home to Dogfish Head Brewings and Eats, a popular brewpub near the boadwalk which, in addition to quality pub food and Dogfish Head brews also serves Dogfish Head vodka, rum and gin produced at the brewpub’s micro-distillery. When we arrived on Saturday night the place was crowded and lively, with The Neon Swing, a swing band playing in back. The brewpub usually offers a few beers not typically available in stores. By the time we got there that night several of these special brews had already been tapped, but what we did try was delightful, and probably the freshest Dogfish Head any of us had ever had. While we were there we also got to meet a reader, Vinnie, who spotted our offer to buy someone a round at the restaurant on Twitter. We were happy to meet him and and his wife, and happy to buy him a round. 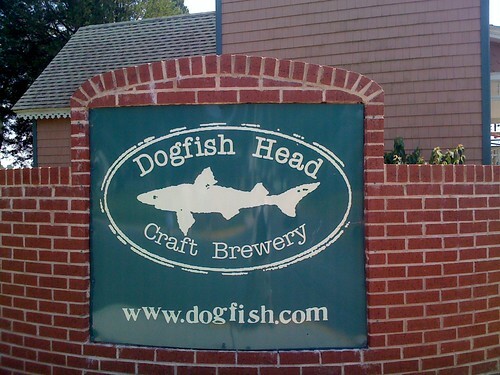 dogfish breweries in America is best in u.s and it's plant is wonderful. the smallest commercial brewery in America are set up very fast and becomes very very large because of government support. Basically beer leaving a keg passes through Randall, a cylinder full of hops and a filter, re-hopping the beer once more before it reaches your glass which is quite to share. In the beginning it took Calagione and a co-worker 10 hours to bottle just 100 cases of beer,today they are the country’s 21st largest brewery,producing almost 2.5 million gallons of beer a year which is good storage. The current economic downturn around the country,the brewery has steadily grown in size,at the staggering rate of 40% per year in the last few years which is quite good to share. The current economic downturn around the country, the brewery has steadily grown in size,at the staggering rate of 40% per year in the last few years is best to share out in the blog while 40% is well rated growth rate. After getting to explore most of the brewing facilities we were provided with four beer samples, Shelter Pale Ale, Midas Touch, Raison d’etre and Indian Brown Ale which is quite good to share in the blog also there are many advantages of it. Beeriety recaps the first stop at Iron Hill Brewery on our weekend road trip to Deleware.